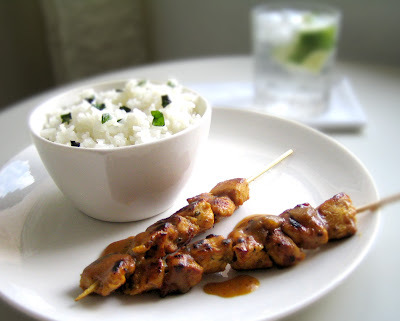 This my new concoction Penang Chicken Skewers. Indian and Malaysian spices plus the famous white wine from Paris is one great fusion, creating an exciting new dish. Along with the basil rice and ice cold water with lime, this dish is so light but very flavorful. Marinade chicken breast cutlets with curry powder, paprika and cumin. Add salt, pepper and lime. Lastly put a dash of sugar. Set aside for 2-5 hour in the fridge. For the sauce, heat medium pan with butter add diluted coconut milk. Simmer it for 15 minutes. Add white wine and simmer it again for 10 minutes. Add sugar, curry powder and cumin. Simmer until thick then set aside. 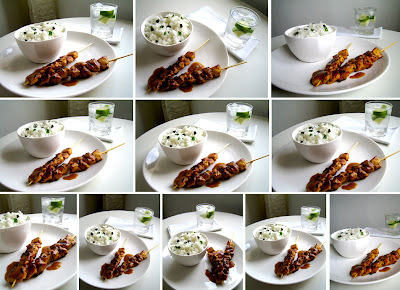 Get the chicken from the fridge and place the cutlets in skewers. Heat grilling pan and grill chicken. Do not overcooked. Serve with the sauce. These are the other shots that I had during my photoshoot. saw u on flickr. jack-of-all-trades? man! galing. what's your busiess xactly?